"Don't underestimate the value of Doing Nothing, of just going along, listening to all the things you can't hear, and not bothering." Sometimes it happens like a rogue wave...just sweeping you away from your intended plans. Last night at one in the morning my feverish littlest one woke up in the night, mumbling and sad. She was thirsty and scared. Advil was given, covers tucked back in, cold ice water close at hand and just like that: my day was revealed. Caroline would be staying home from school. All those other things that busy my days would need to be left behind. Back in my own bed I started restacking the deck...perhaps I could go grocery shopping then, maybe I might find this missing email during a possible nap, potentially clean the desk that is towering with things that need to be dealt with right.this.minute. It's a Mommy and Me Day! Mommy and Me Days began in preschool. Being fourth in line means most of the time other people are hanging around. Most of the time -- heck 99.5% of the time -- other schedules and important events dictate your day. You watch other people play sports or sing in the choir or perform in a play. Most of the time, you are last on the list. But Caroline figured out even at age three that when those other kids went off to school, she had a Mommy and Me Day. She knew when her preschool days were, knew when I was working at her school and knew when I was all hers. She cherished it and named it and helped me to notice the precious present. Since she started kindergarten she would lament the lack of Mommy and Me Days. We would take a bike ride or go get the dog food together but it wasn't quite the same. Our life had changed. Schedules were different. Although that time was something I missed too, there didn't seem to be a natural opportunity to recreate it. First grade began and the busyness of life took over. We'd sneak an errand or enjoy her friend's birthday parties together but that luxurious giant chunk of time was nowhere to be found. Enter the fever time out. Mommy and Me 2013. Pretty sad that it took that to make us have the time...but what a fun, fun time it was. We played a serious set of Hangman, leisurely ate breakfast, walked Buddy and discussed at great length how amazing, sensational and terrific our dog really is. We played Bop It like a couple of kids at Christmas. We danced and laughed, snuggled and used a pretend brush to paint make up on each other. We watched our old friend Winnie the Pooh and his Blustery Day...giggled with Tigger, cheered for Piglet and felt sorry for Eeyore. Together this six year old and 40 something mom added up to 22...belting out and dancing to Taylor Swift's song. Our math may be wrong but we have some rockin' moves...no doubt. We had chicken noodle soup for lunch and became chefs...wearing our aprons and cooking up brownies and other treats that were necessary, so necessary for healing and fever breaking and general good health. So today I'm grateful for the forced time out. Time out of schedules and other people who come first. Today I spent the day exactly as it needed to be spent...thank you Advil, thank you little bug, thank you Caroline. Do you have somebody that you have to deal with that is a jerk with a capital "J"? And here's the weird part. He's a priest. He should be holy and kind and full of compassion. Instead he just points out what you're doing that isn't holy enough. He's full of criticism, instead of acceptance. He's focused on things instead of people. He is literally as UNpriest-like as you can get. You interact with him and shake your head. It doesn't make sense. The dots don't connect. I mean, honestly...why on earth did you become a priest if all we do as a parish just makes you crazy?? It's been a weird dilemma. I'm all about giving chances and dealing with change. I like new experiences and new people. I want to like this guy I really do, but the vibe is negative...real negative. And how do you deal with negative when he's a priest...someone who automatically receives your respect and admiration just by his holy dedication to his vocation?? Guess what...turns out that I don't do well in that regard. Turns out, I lost it. I gave my priest a dressing down and still I can't believe I did that. Why didn't I do deep breathing...meditation...visualization...words of affirmation?? I only lasted six months with this guy. There aren't enough Hail Mary's, Our Father's or Glory Be's that could get me through. I have suddenly been faced with a truth that Catholics don't like to face. Those poor guys are human. They are doing an inhuman job. I've been blessed to know a number of priests that have made it look easy. Darling Monsignor Wade, Father Looney, Father Bong, Father Richard...these have been the men that have literally "oozed kindness and the love of Christ out of their pores" as my dental hygienist described it. I was spoiled by strong leaders and great men who are kind and compassionate at their core. We ask them to be the face of Christ...demand it...and yet, when do they get an "off day"
Catholic parish priests have to keep it together, remain holy and kind, even in the darkest of times. This man is dealing with something...it's obvious. He's out on a ledge and swinging. He deserves some help and I'm sad to say all I gave him was my two cents. Two cents too much, I'm sure. How about living the compassion, Beth? How about walking the walk? Somehow, it's a whole lot harder with a priest. So...I guess I'm grateful for learning very late in life that priests are human and NEED our compassion. They need options and they need to be not so isolated. How does a priest get help?? So...I've lived in my town for 15 years...had kids at the same school for that time. My town isn't big and I've explored a lot of it. Of course there are always new nooks and crannies to find but I know most of it very well. I've scouted out the local "big" city...visited some other favorite parts of my state and even ventured out of state several times...but I admit it. I'm ready for more. I need some adventure, people. I need new faces, new places and maybe even some wide open spaces as The Dixie Chicks liked to sing about. I don't have a death wish or even need an adrenaline rush...I just want to explore. When my family went to Hawaii a few weeks ago, I asked out loud who would want to visit Haleakala with me. Haleakala is the highest point in Maui. 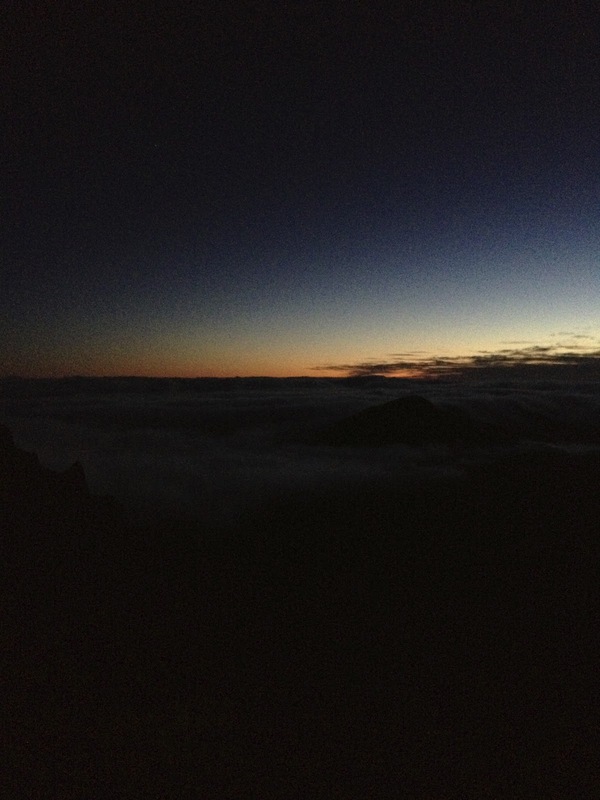 It is over 10,000 feet high, a dormant volcano, and an amazing place to see the sun rise. I had wanted to go for years but no one wanted to come with me. This time, Jack was up for it. 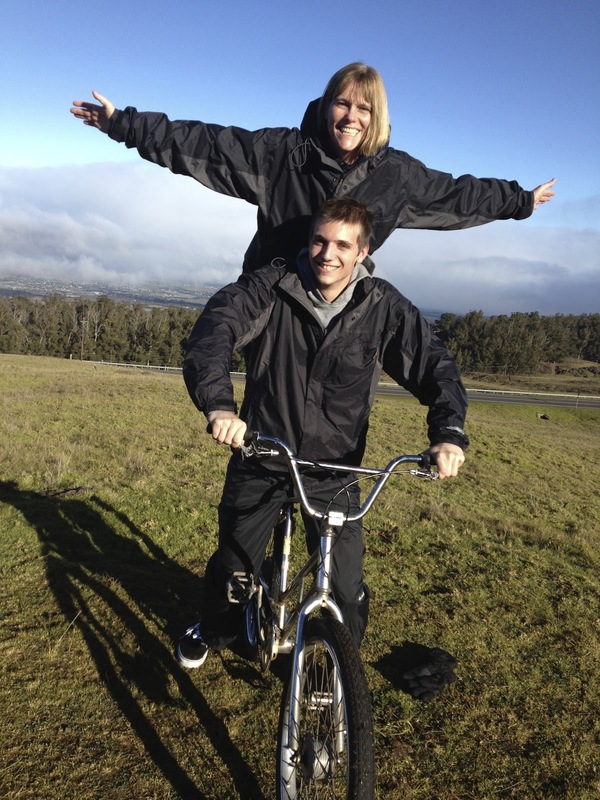 We decided to bike down from Haleakala with a group...28 miles, all downhill, ending up at the beach. It sounded like just the adventure I needed. It included a 2am wake up call and a very long van ride up a huge mountain in the dark. I left warm and tropical Maui and entered mountain cold. Jack popped up, we gathered our things and went looking for our shuttle. We found him in the dark and for the first time I wondered, "What have I agreed to?" It wouldn't be the last time I asked this question. After we picked up other people and made our way to the main town of Kahului, we were given coffee and a video explaining the risks of riding a bike downhill with a group. We were told it could be raining and slippery making for a treacherous ride. (Insert above question to myself here.) It was still very dark and misty so I wasn't sure what our weather was going to be like. They passed out nylon waterproof shells that we could put over our clothes and showed us their winter gloves that we could use as well. I felt like a computer that just couldn't process the information. How could tropical, balmy Maui be Canada cold? Turns out 10,000 feet makes a big difference. We drove our shuttle up the winding road to the top of a dormant crater, Haleakala. We all were quiet and sleepy...nobody knew what to expect. We arrived at the summit in total darkness...the first shuttle in the parking lot. We put on our shell and headed outside. The cold air outside shocked us awake and Jack and I made our way to the one warm room at the top of this mountain: the gift shop. After warming up and getting our bearings we ventured outside for the view. We might get a real sunrise. Boy, were we given a sunrise! Non-stop performance is more accurate. Mother nature went for it big time. No, that is not the ocean...that is fog filling the crater with whipped cream waves. The dance of light, mist and mountain...truly stunning. Now imagine a traditional Hawaiian chant greeting the new day. Imagine looking with hundreds of others at the world below. Imagine silence and camera clicks. Imagine so many sharing in such a sacred beginning. We were ice cold...but we were smiling. 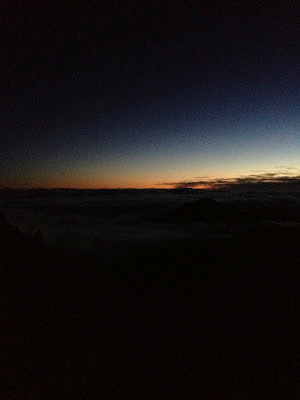 Our guides told us that we were the first sunrise that you could see since Christmas...10 days prior. We felt lucky. But we also felt nervous. How were we going to get down this mountain on a bike? We got back in the shuttle and made our way to the entrance of the national park. We kept our shell on and tried to warm up. When we got out of the shuttle just a few miles down the mountain, the mist was running over the mountain and straight on top of us. I started shivering. My toes got that numb feeling so well known from ice skating. I looked at Jack and he gave me a smile. We weren't completely crazy...just a bit. I got on my bike and got in line on the side of the road. We had a family of 6 people with us from Toronto, Canada; we had a pair of honeymooners from Santa Cruz, California; we had one lone adventurer, Amanda, from Sydney, Australia (if you think it's hard riding down a huge mountain, try doing it on the wrong side of the road, like Amanda! ); Jack and me. Owen would be our fearless guide. He could ride the bike practically side saddle so that he could see behind and check on his ducklings. In the cold mist, on a wet road, we began to ride -- straight down. We had 29 hairpin turns in 8 miles. Needless to say, I took my time and tried not to get too distracted by the indescribable view. We all made our way down the mountain. Owen gave us hand signals of when to get to the side, when to slow down, when to notice something. After a very short time, we got to stop and admire the view. 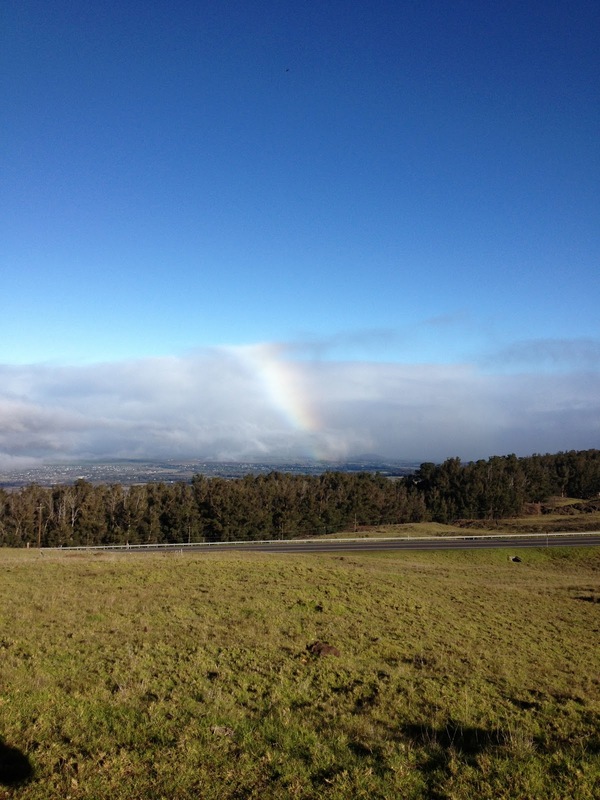 Yes, that is the faintest of rainbows guiding the way to a eucalyptus forest. The first 8 miles are the most treacherous and dangerous. Since we made our way through the hardest part, we had to celebrate with an early breakfast at a lavender farm. Life does not get any more tranquil or peaceful than celebrating your survival on a crazy mountain with a cup of hot chocolate, a breakfast burrito and your son. Wow! After our breakfast we rolled through the upcountry town of Kula -- where Tom Selleck and Randy Travis make their homes. We meandered by sugar cane fields. We coasted into the cowboy town of Makawao. We rode on empty roads and enjoyed the sounds of bike tires spinning. We could smell plumeria and see the beauty of hibiscus in its natural setting. We were seeing the rural part of Maui, the secret part. I felt daring and privileged to see and know something that I had never taken the time to notice. We rolled into the hippie town of Paia, with its cute shops, gelato ice cream and surf shops. We were slowly weaving our way back to the touristy Maui we knew and loved. Last stop: the beach. Owen had us stop at a surf beach...giant waves, native Hawaiians surfing and a whole bunch of mainlanders trying their hand at the impossible. We just watched the three and four layers of waves break on the beach, hypnotized by the surf and the sound of crashing waves. Jack and I weren't even tired -- we're not used to riding only downhill -- but we sure felt accomplished. We did it. We survived a sunrise at 10,000 feet, a crazy bike ride downhill and hairpin turns and mist that acted like the natural obstacles of a video game. Best of all, we did it together. I'm on the lookout for more adventure in 2013. I might have to stay a bit more local but I'm up for anything...roller derby, a hot air balloon ride, a hike to some unknown spot. Do you have any good ideas for me?? 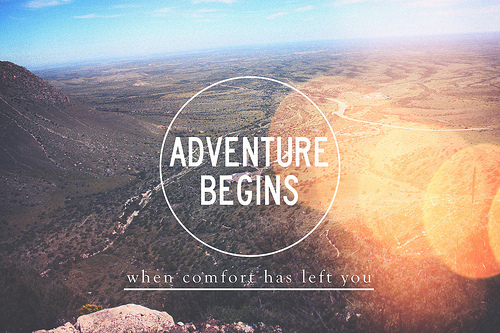 Better yet, what adventures are you hoping to take?